I'ts that time of year again. 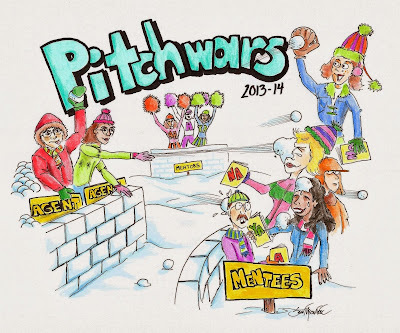 Pitch Wars is here and as usual I'm freaking out. Its the same "Did I do enough?" "Did I do to much?" "Is my MS crap?!" I hate the waiting game, but I hate the rejection more. Ahhhhh! Like a good aspiring author I sent my MS out this morning to 4 mentors that I thought would be a good fit for me and my writing. I had to narrow the field from 46 to 4. Let me tell you, that was not fun or easy. Now I wait till the 11th to see if I was picked for the agent round. I heard there is a lot of competition though. 1700 entries with still 10 hours to go. Not good odds, but I believe in my work... I think... Yes, yes I do. 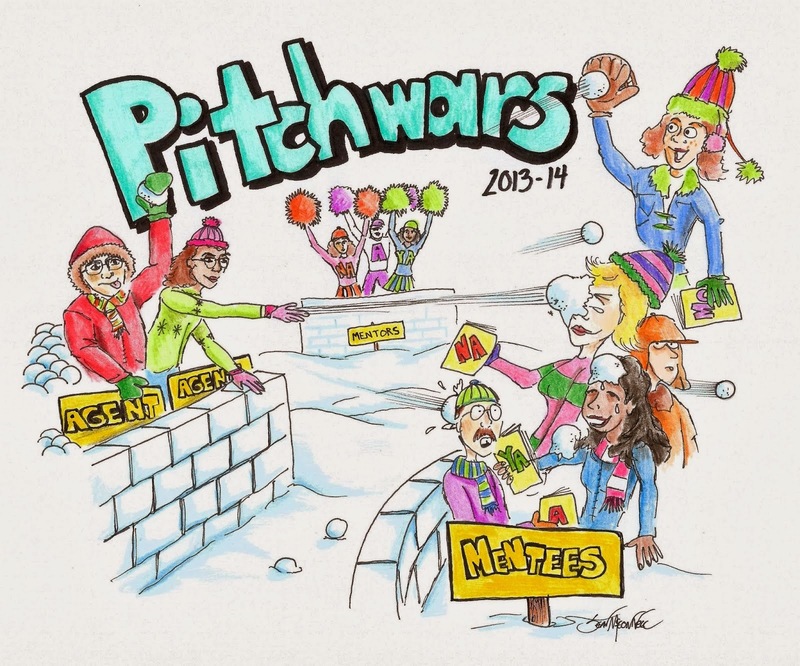 Even though its too late change anything, here is what I submitted for Pitch Wars. The ancient blood of the master races flows through Tabor’s veins. Power. Magic. A death sentence. In the south, the Dominion hunts down anyone with the blood of the ancients –and on her nineteenth birthday, they find Tabor. Captured by the murderous Dominion leader, Lord Farenan, Tabor and her magic are all he needs to claim true power in the world. He will use her magic to find her people and enslave them. Unwilling to be used, Tabor escapes and places her trust in her new caretaker who promises to aid her in finding her people – a people who have not been seen in a century. Tabor quickly finds that her new ally has his own agenda. Betrayed and recaptured, Tabor is taken to the heart of Winter Land and forced to search out her ancestors. Her people hold the secrets to her safety and her freedom – but Farenan seeks to make Tabor their destruction. Then the dream came. It was cold. The chill touched my soft cheeks and bit at my nose. Momma was screaming nearby, calling to me. Where was she? I cried, letting the warm tears run down my face. I cried to her without words, only because I didn’t know any. Momma? Her screaming had stopped. They all had. The silence that came was deafening but calming in an odd sense. I was the only thing making sound with my crying now. The heat from my tears helped warm my skin but it wasn’t enough. I still shivered from the cold, or was it fear? I was too young to know the difference. Where was Momma? My hands reached for her but all they found was the cold snow around me. Where was she? Why didn’t she come? I woke with sweat running down my face. A cold draft blew over me from the open window as I tried to make sense of the nightmare that haunted me. It was always the same. I could hear her. I could hear all of them, but the only thing I could see was the snow falling around me. The eerie sounds of their long lost voices played over and over in my head. I ran my hands through my sweat soaked hair. Make them stop! My thoughts were interrupted by the bell in the tower. I dreaded that sound. It meant that I would have to live one more day hiding who I was and where I came from. I guess it was better than the nightmares I faced when I slept, but I didn’t know how much better it was. As the bell chimed again calling to me to get out of bed, I remembered what this day meant. It was my nineteenth birthday. It would mark one year that my magic refused to emerge. One year that I was a misfit between normal and Artican. I was beginning to doubt my origins. Maybe I wasn’t who I thought I was all along. Maybe this master blood that was supposed to be running though my veins was a myth. Who knew? The masters had been gone so long they could just be stories that were told to children at bed time. No. I had to keep believing in my future. Otherwise, what was I living for? My small room was oddly cool. Rolling onto my side, I gathered my sheepskin blankets up around my chin and pulled my feet close, attempting to warm them before I dozed back off to sleep. What was the point of waking now? I had nothing to show for myself. Not even a speck of magic flowed from my finger tips. It was embarrassing. Not that anyone knew who I was, but I knew, and that was enough. I tried to doze off again. Maybe I could get another hour of rest before I faced the world. The images of my nightmare haunted me still, lingering in my thoughts. Nineteen years. Nineteen years had gone by with these images. For some reason they bothered me more this morning than they had previously. It was unnerving. There was a knock on the door, bringing me from my haze. A sigh escaped my lips. I knew who it was. Delah my best friend. She had probably come to check on me, to make sure I was ok. The wooden door creaked open and Delah’s mop of red hair peeked around the corner, followed by the rest of her. There was concern present on her face. I hated it when she looked at me like that. It was pity in her eyes. I didn’t need her pity or anyone else’s for that matter. I had accepted the fact that I was alone, why couldn’t everyone else? “I’m glad to see you’re… awake,” she sat on my bed next to me as I sat up and scooted over to make room for her. Glad? Who was glad? I was nothing. I wasn’t a human and I wasn’t an Artican. How could she be glad? I forced a smile. Maybe she would leave me alone if I looked optimistic. Probably not, but it was worth a try. I was startled out of my daze again. Delah was probably trying to tell me something important, something that would cheer me up. I didn’t even know why she tried. I was a lost cause. “The nightmare again.” Delah rested her hands on mine, giving me a weak smile. It was of little comfort now, but a nice gesture all the same. My white skin was pale in comparison to her dark tan and cold as well. It was a reminder of how different we were, how I didn’t belong here. She was one of two people who really knew what I was. An Artican. A member of one of the three master races that have long since disappeared. No one knows why they left, but it was convenient for them to leave me here without a hint as to where they went. I had been separated from my people when I was a baby, brought here by the grace of the Overkeeper, and raised with the knowledge of what I was and what I was capable of. Although my magic hadn’t began to surface yet, it would hopefully come soon and those who found out of my Artican decent would try to use me for their own bidding. “There is always hope,” Delah whispered. It felt like she was reading my mind. I didn’t like it. She had a way of always knowing what I was thinking. I was beginning to wonder if she too had special powers or maybe she was just that in tune with my moods. I had heard stories of mind readers. People claiming they were decedents of the Dominion, one of the master races. People would say or do anything these days to gain power, but still, there was talk of a warlord from down south that used dark magic. He was gathering an army. For what, I didn’t know, but I had to be careful these days while I was without my magic. “You’re right Delah, there is always hope,” I sighed. I felt a little better, but I was sure the feeling wouldn’t last long. It never did. “I just wanted to bring you this,” Delah placed a small bundle in my hands. It was wrapped in a scrap of brown burlap and tied with twine in a neat bow around the top. “It’s a birthday present,” a smile crept across her face. Speechless, I pulled the twine. The scrap fell open on my lap revealing a leather bound wrist cuff with brass rivets around the edges. It was amazing. My fingers caressed the worn leather. It was oddly soft, not like anything I had felt before. Not even from the leather workers in the towns nearby. “Where did you get this?” I picked up the cuff to examine the broach secured to the middle of the leather. It appeared to be a family crest with a snow leopard in the middle. I wondered what it meant. “Why didn’t he give it to me himself?” I pressed her for more information.